Yes, it was one of those days when you weren’t sure to have the roof on or off. Fortunately the offs were longer than the ons. 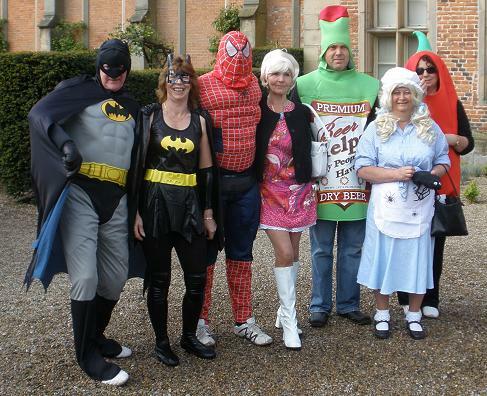 The morning proved quite pleasant as 57 cars gathered at Kiplin Hall for coffee/ chat, as the crazy gang (YDCCC members) arrived in various disguises as Batman & Bat woman, Spiderman & Little Miss Muffit, Bottle of beer and chilli pepper, we also had a visit from Dusty Springfield, it all went to promote a carnival feeling and caused much merriment among the visitors. As the cars are the reason to be there we had an excellent display with a magnificent Lagonda which I think we have seen before and a new one this year in the shape of Geoff Dodds Model A Ford, also nice to see that lovely Aston Martin of Sam & Jane Sammells which had made it after some hasty repairs. Tea/coffee over the cars departed for an excellent 100 mile drive around the dales taking in upper Wenslydale on into Dentdale completing a round trip back down into Hawes & Leyburn and return to Kiplin. Some new roads to explore from last year, not an easy achievement after several years of this event so well done to organiser Bry and his trusty aid Alan. Once again the afternoon display enticed a good attendance from the public to view the cars. Which apart from a brief shower stayed fine and dry for the most part ? Prize giving for the furthest travelled went to a couple from Birmingham with their MG B, and the best dressed couple went to the Sister Act duo of Tony Mason and his wife who even completed their act with sun visor on the car, 70’s style. Well done.